The use of the hiop stabilizer kit reduces the lateral rolling of your vehicle and fine tuning of it´s handling characteristics i.e. Under steer, over steer, etc. 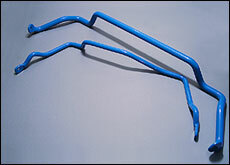 hiop front and rear sway/stabilizer bars are manufactured from chrome silicon steel and finished with a zinc protective coating covered in heavy duty powder coating. The kits come with polyurethane bushing and linkages where necessary.